Who would think that kale could take the place of my beloved food bad-boy potato chips? It does. *NOTE: Not all furikake flavors are gluten-free. Nori and shiso are GF, but tamago (egg) contains wheat. Always best to check the ingredient list. Cut the tough stems off and cut or tear into bite-sized pieces. Dump the kale pieces into a mixing bowl. Drizzle enough olive oil to coat kale pieces. Lay kale pieces in a single layer on a broiler pan or sheet pan. Salt and pepper kale. Proceed to baking step. Sprinkle with furikake and toasted sesame seeds. Proceed to baking step. Sprinkle with pepper and toasted sesame seeds. Proceed to baking step. Make teriyaki dipping sauce while kale bakes. Bake at 350 degrees for 20-25 minutes. 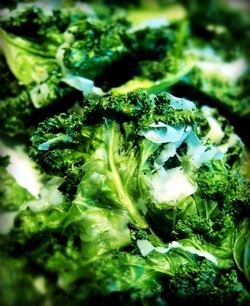 If you want to add parmesan cheese, sprinkle it over the kale chips and bake for the last five minutes. The edges get very crunchy very quickly, so be sure to watch a bit during the last few minutes. Eat while warm for maximum crunchiness.